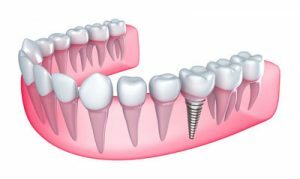 What is the treatment process of dental implants? At the end of dental implant treatment, the completion of the prostheses takes longer than classic treatments because 2.5-4 months are required for titanium structure to become integrated with the bones. Additionally, waiting for 6 months is required if any intervention is made to jaw bone or in the upper jaw, if sinus floor elevation is performed. However, the results of this waiting process will be longer-lasting and highly satisfactory. Especially, due to ongoing alterations of the bones of patients who were toothless for a very long time, their current prostheses start to cause dents and move losing their adaptation. It is not possible for prostheses which are immobilized with implants to pull out of the mouth or move. Hence, they are remarkably practical and comfortable. Is dental implant operation difficult? The operation, which is conducted under local anesthesia by anesthetizing only the area where the implant will be placed, is painless. At our DentGroup Dental Clinics, even the anesthesia injection is aimed to be painless with the use of digital anesthesia method. Treatment process is quite comfortable if prescribed medicine is taken before the operation, antiseptic mouthwash is used after, and oral care is done properly. Does my face swell too much? Will there be a lot of pain? Slight swelling and color changes are expected on cheeks. Yet, swelling would swiftly decrease if cold compress is applied within the first 24 hours. Intense pain is not seen. Painkillers which are recommended by your dentist are sufficient to easily control the pain which may develop within the first day. How is the dental implant process? How long does it take to be completed? We wait for the cohesion of the implants to the bones for approximately 3 months in the upper jaw and approximately 2 months in the lower jaw and porcelain veneers are applied on them. Waiting process may be as long as 6 months if there are any additional interventions due to thin or insufficient leveled bones. Is implant without any sutures possible? In such cases in which there is only one tooth extraction, it is possible. Dental implant can be placed at the same appointment if there is no cut on the empty socket. Is there any possibility of harm? It is said that sometimes the body rejects implants. Is it true? Implants are made of titanium. Titanium, which is in biological harmony with the body, is a precious non toxic metal which does not pose a risk of allergic reactions. Is dental implant right for me? Its application to patients who do have systemic diseases which are not under control and those who recently got radiotherapy and chemotherapy is unfavorable. However, as soon as the disease is under control, implants can be applied to everyone. If required amount of bone is not measured, dental implants can be placed after substructure is formed with the help of additional interventions. Lifespan of dental implants is the same as natural teeth. They can be used for a very long time as long as standard oral care is done properly. I do not want to wait for 2-3 months. May I use my false teeth with dental implants? Yes. With the help of mini dental implant technology, existing removable dentures can be used adapted to implants after operation.